In WebWave we calculate basic statistics of every website and share it with webmasters. You can see how the popularity of your website changes and check if marketing increases traffic. In order to see statistics on your website, enter Webmaster's panel and select statistics next to the chosen website. On the traffic graph you can see how many views your website gets each day. It is useful when trying new trends or buying new ads. It easy to check if a new advertisement influences traffic on a website. 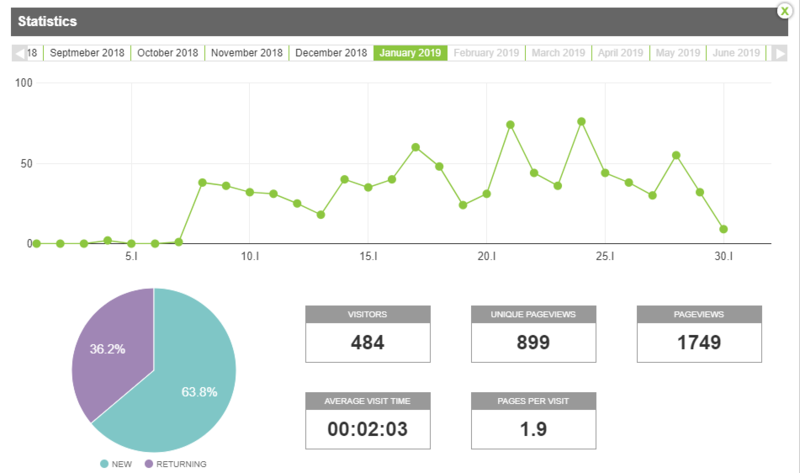 Pie graph at the bottom of the window shows how many percents of visitors have returned to your website and how many entered it for the first time. It is a number of users who entered your website in a particular month. To be more precise, it is a number of devices and browsers, which were used to visit your website. If one user enters your website in Firefox browser and then in Chrome, it counts as 2 visitors. It works the same way when they enter it on two different devices. The number of visitors should be treated as an approximation. When a user enters your Home page, it counts as a 1 unique pageview. If he also goes to About us subpage and then to the Price list, the number of unique pageviews is 3, but when he decides to go back to Home page, this step doesn't count as a unique pageview anymore. Every user generates as many unique pageviews as a number of subpages he visits. It is a number of all visits on all subpages. Let's say visitor enters 10 subpages, 5 times each. The number of pageviews is 50 when the number of unique pageviews is 10. It is an average visit time that users spend on your website during one visit. Some users can spend on your website even a couple of hours when some of them will exit after a few seconds. Average visit time is a sum of time spent by all visitors divided by the number of visits. It is an average number of subpages user enters during one visit. It is calculated in a similar way to an average visit time - we divide the number of all visited subpages by the number of all visits.